Single… Not by Choice is a look into the lives of widows, and those who know them, love them and advise them. Inspired by the trials of women left suddenly widowed, this book shares their stories and gives the much needed and often overlooked perspective on the challenges of a widow’s journey. Told through the interviews of widows, their children, and their attorneys and therapists, the book provides a clear picture of the difficult path they face and the ways that we can all help them to move forward. Along with financial guidance to help secure their future, David Rust and Shane Moore explore the often complex challenges that widows face from both practical and emotional perspectives, with ideas for more compassionate support by friends and family during this difficult transition. 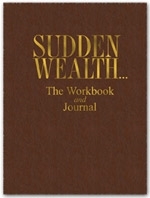 The latest edition to the Sudden Wealth book series is two books in one. The Workbook serves as an important guide to help sudden wealth recipients make better financial decisions. And for every family, whether sudden wealth or not, The Journal provides a “go to place” to document every financial decision, asset, and final wish. Financial advisors and authors, David Rust and Shane Moore have built their wealth management practice around comprehensively handling the needs of sudden wealth recipients and their families. This Workbook and Journal serves as an extension of their knowledge, experience and viewpoint. It is a must have for every family! Sudden Wealth... Blessing or Burden? In their award winning first book, Sudden Wealth... It Happens, wealth advisors David Rust and Shane Moore write about seven families who find themselves in sudden wealth scenarios brought on by various life events. The authors are back with a second edition, Sudden Wealth... Blessing or Burden? Included in this compilation are the original stories and applications, a new eighth story, a look at inheritance and the probate process and a psychological analysis of each story provided by family therapists Pam Monday and Dianne Arnett. "For many sudden wealth recipients, we have found that understanding the emotional hurdles behind the sudden wealth situation can be just as important as the financial planning and applications," says Rust. "The insight that Dr. Pam Monday and Dianne Arnett bring to the psychological issues of sudden wealth are invaluable to helping sudden wealth recipients become not just financially healthy but emotionally healthy as well," adds Moore. 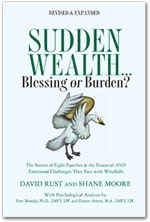 Emotionally engaging and thought provoking, recognized wealth advisors David Rust and Shane Moore's compilation is a unique combination of fact and fiction that inspires fiscal sanity and confidence. Through various events, including inheritance, a lottery jackpot, and a business sale, seven fictional stories depict families and individuals confronted with the reality of their own sudden wealth situations. They come from different walks of life and very different paths, yet each find themselves with more money than they have been responsible for in the past and struggle with the challenges it brings. Each story is inspired by the real-world experience during Rust and Moore's extensive careers. Used as a means of making the reality of these situations much more concrete and visceral, they also provide a compelling segue to the second section of the book wherein the authors provide a resource to assist readers in recognizing steps to take when faced with a sudden wealth situation. Deftly weaving experience and storytelling, Rust and Moore create a unique financial guide that resonates more thoroughly and completely than typical DIY wealth formats. 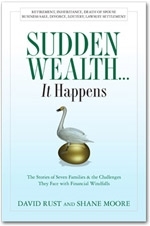 Informative and insightful, Sudden Wealth...It Happens is a tremendous resource for anyone who experiences a sudden financial windfall.